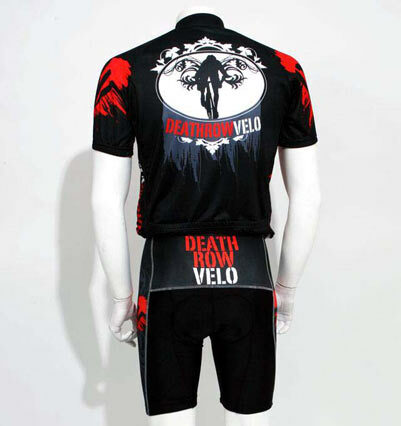 DeathRow Velo is an new U.S. based company offering an interesting mix of products and services. John Landino created the company primarily to offer an urban-inspired, edgy cycling clothing line designed for bike racers. Not Euro, not retro, and not hipster, but a bold, brave American style. A quick glance and you think Rock Racing but not green. We think it’s smart, as Rock Racing’s kit has been successful for two reasons: 1) you notice it even in a crowded peloton, and 2) everyone has a strong opinion about it, making it memorable. With it’s skull-based logo and contrasty designs, DeathRow garments are certainly memorable. The company offers several different designs of jerseys, shorts, and bib shorts, and are likely to be a good match for the block-party atmosphere common at cyclocross races, especially at the more urban venues. 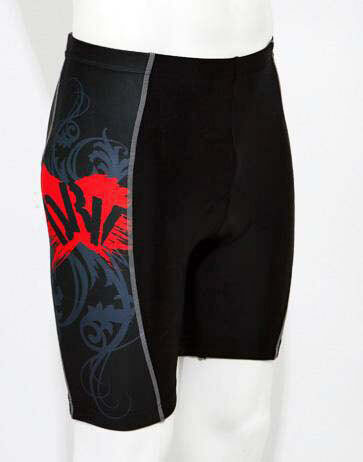 Manufacturing is handled by a “world renowned contract manufacturer” and the jerseys use Coolmax fabric while the shorts and bibs use a nylon/spandex hybrid with a Coolmax Antibacterial Chamois. The company is working on more designs and products, and with some luck, they’ll have some ‘cross-worth warmer gear by fall. With national cyclocross champion Roger Aspholm involved with the company, you can be sure future garments will have cyclocross in mind. 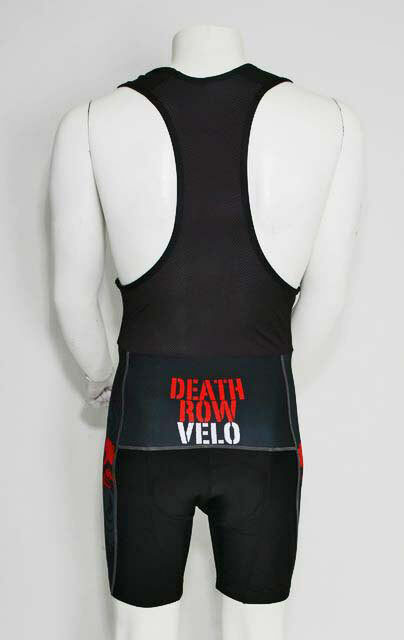 DeathRow Velo also offers more than just its branded garments. It’s offering custom clothing for teams, and is also launching a national USA Cycling team for the privateer that’s looking to join a club. It’s quite a lot for a small, new company that was inspired by an Landino’s anger after his botched sprint finish at local race. Stay tuned for a review of DeathRow’s garments.